DIED FEBRUARY 20TH 1865, AGED 62. DIED FEB. 12TH 1891 AGED 81. DIED SEPT. 28TH 1912, AGED 67. Stephen Phipps was born in Ascott-under-Wychwood in 1804 and baptised there on 20 May. He was the son of the labourer Stephen Phipps senior and Martha Eggington, who were married at Ascott-under-Wychwood on 2 December 1800. Stephen's elder brother Philip was also baptised there on 1 December 1801. They then moved to nearby Chilson, and next child David was baptised at St Mary's Church, Shorthampton-with-Chilson, and their last three children at Charlbury church: Mary Ann (1810), Phebe (1816), and Harriet (1817). Mary Kimbell was born in Charlbury in 1809 and baptised there on 2 August. She was the daughter of William Kimbell and Sophia Wright, who were married at St Giles's Church in Oxford on 5 November 1806: both were described as then lodging in that parish. Mary's five siblings were also baptised at Charlbury: William (1808), Joseph (1812), Ann (1814), Edward (1816), and Susanna (1817). died at Broken Hayes at the age of two and buried at St Peter-le-Bailey churchyard on 9 November. George Phipps (born at Ward's Gardens, Oxford on 7 January 1853 and baptised at St George the Martyr, the chapel of relief for St Mary Magdalen Church, on 13 March). Stephen and Mary Phipps began their married life in Charlbury, but had moved to Oxford by early 1840. At the time of the 1841 census they were living at Ward's Yard off George Street in St Mary Magdalen parish with their sons Stephen (6) and the first one called George (1). By the end of 1841 the family was living at Broken Hayes in St Peter-le-Bailey parish, and their son George died there at the age of two. At the time of the 1851 census Stephen (47) was a gardener, living at Broken Hayes with his wife Mary (41) and their children Stephen junior (16), who was also a gardener, and Ann (9), Martha (6), and Philip (nine months), plus a servant. By the time their last child, another George, was born near the beginning of 1853. they were living at Ward's Gardens in St Mary Magdalen parish. By April 1855 they had moved to Red Lion Square, also in St Mary Magdalen parish. Lucy Mary Chennell, the daughter of the tailor Joe Chennell. At the time of the 1861 census the family was in Red Lion Square in a house divided into three. In one part lived Stephen Phipps (57), now described as a horse clipper as well as a gardener, his wife Mary (51), and their children Ann (19), who was a dressmaker, and Martha (16) and George (8). In a second part lived their eldest son Stephen Phipps junior (28) and his wife and daughter; and the third part was occupied by a widow and her daughter. 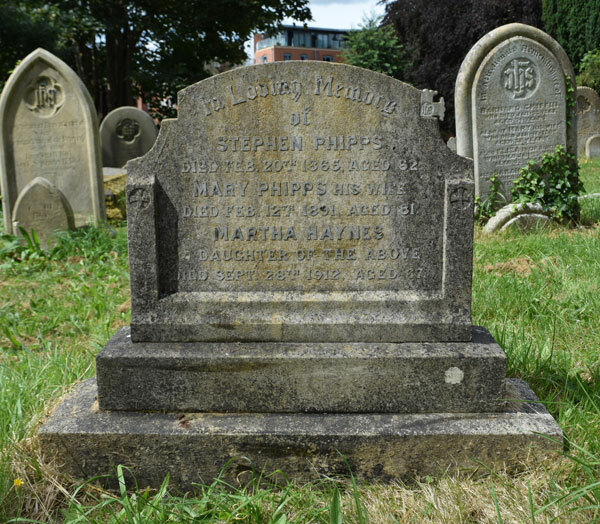 † Stephen Phipps died at Red Lion Square at the age of 62 on 20 February 1865 and was buried at St Sepulchre’s Cemetery on 23 February (burial recorded in the parish register of St Mary Magdalen Church). In the fourth quarter of 1869 in Reading, Martha Phipps married Edward Goodden Haynes, the eldest surviving son of Edward & Mary Ann Haynes (see separate grave of Martha's parents-in-law). In 1871 Mrs Mary Phipps, a widow of 63, was living at 1 Gloucester Street with her married daughter Martha Haynes (26), who was a dressmaker, and her youngest son George (18), who was a printer's apprentice. Mrs Phipps (71) was still at that address in 1881 with her son George (28), now a master printer, and the paper-hanger William Couling was lodging with them with his wife and child. On 21 October 1889 her son George (36) was matriculated at the University of Oxford as a non-collegiate student. His school was given as Mr Thorogood's: this was Bedford House School in Walton Street, opened by John Harris Thorogood at 130 Walton Street in 1873, which he moved to 122 Walton Street in 1875. As George was aged 20 when the school was founded, he must have studied there as an adult, probably in the evenings. † Mrs Mary Phipps née Kimbell died at 1 Gloucester Street at the age of 81 on 12 February 1891 and was buried at St Sepulchre’s Cemetery on 15 February (burial recorded in the parish register of St Mary Magdalen Church). In the fourth quarter of 1895 in the Oakham district of Rutland, George Phipps married Sophy Elizabeth Berridge, who was born in Empingham, Rutland in c.1868. Martha Phipps (born 1844) and her husband Edward Goodden Haynes (born 1846), who were married in 1869, do not appear to have had any children. In 1871 Martha (26) was working as a dressmaker and living with her widowed mother at 1 Gloucester Street, while her husband Edward Haynes (24), who was a commercial clerk in cotton, was lodging on his own in Stretford, Lancashire. In 1881 Martha (36) was back with her husband Edward (34), and they were living at 6 Elm Terrace, Bray, Maidenhead, Berkshire. They then appear to have separated, and Edward is hard to locate thereafter. In 1891 Martha (46) was back in Oxford, working as a dressmaker and living at 8 Observatory Street with her niece Annie Godfrey (the daughter of her sister Ann) and her brother George Phipps (38). Her niece Annie Godfrey married Joseph Jennings Curtis in the Maidenhead district in 1897, and in 1901 they were living at Oakthorpe Road, Summertown. The head of that household is listed as Mrs Matilda Hayes (56), and this may be an error for Mrs Martha Haynes, as the age is right and she cannot be found elsewhere in the census. In 1911 Martha (66) was living at 18 Osberton Road with her niece Mrs Annie Martha Curtis, née Godfrey and Annie's husband Joseph Jennings Curtis (37) who was now a shop assistant (antique furniture). † Mrs Martha Phipps née Haynes died at 18 Osberton Road, Summertown at the age of 67 on 28 September 1912 and was buried at St Sepulchre’s Cemetery on 2 October (burial recorded in the parish register of St Mary Magdalen Church). Her effects came to £1,171 4s. 3d., and her executors were the builder's assistant Ernest Godfrey, the builder's assistant Joseph Jennings, and the commercial clerk Edward Gibbins. Stephen Phipps junior (born c.1835) was a horse-clipper & gardener in 1861, living in part of his parents' house in Red Lion Square with his wife Lucy and their daughter Ann (four months). In 1871 Stephen and his wife were living at Gloucester Green with their three children: Annie (10), Percy (7), and Alice (six months), plus a lodger. Their address was given as 4 Gloucester Green in 1881: Stephen (46) was a gardener; his wife Lucy (45) and daughter Annie (20) were dressmakers; his son Percy (17) was a whitesmith; and Alice (10) was still at school. By 1901 Stephen (65) was a college servant, and he lived at 54 Cornmarket Street (above Gillett's Bank, now the south part of Barclay's) with Lucy (64) and their daughter Alice (29), who was a dressmaker. Ann Phipps, Mrs Godfrey (born 1842) was living at 2 Telegraph Buildings, Reading in 1871 with her husband Albert Godfrey (28), who was a carpenter, and their children Ann (4), Susanna (2), and Albert (1). At the time of the 1881 census Ann (39) was living at 7 Grove Road, Bray, near Maidenhead with Albert (39) and their children Susanna (12), Albert (10), Charles (6), and Kate (1). By 1891 they were living at Genfell Avenue in Bray, and Albert was more precisely described as a carpenter on the Great Western Railway, and their son Charles (17) was now working as an indoor servant. They had two more children: Ernest (8) and Edith (5). In 1901 they were living at 9 Catherine Street, Reading with their sons Charles and Ernest, who were both clerks. In 1911 Ann Godfrey (69) and her husband Albert (68) were by themselves at that address: they recorded that they had had twelve children, of whom six had already died. George Phipps (born 1852/3) and his wife Sophy had just one child: George Berridge Phipps, born at Mill Street, Islip on 28 July 1898 and baptised at Islip on 5 September. In 1901 George (48) was still a master letterpress printer, living at Mill Street, Islip with Sophy (32) and their son George (2). By 1911 George (58) was a clergyman in the established church, living in the Rhondda at 48 Stuart Street, Treorchy with his wife Sophy (42), while their son George (12) was boarding at Cowbridge School.